You’re probably familiar with ‘fear of failure’ – it’s one of those anxieties which makes perfect sense. Failing is bad, right? So, it’s natural that we would wish to avoid it. But what about the opposite of failure? What about fearing success? If you think about what success means, it’s not that odd… Success means change. Most of us are a little bit worried about change as it carries an element of risk. The risk comes from moving from the known to the unknown. Yes, we might be able to research or even picture the situation, but until we have lived it for ourselves it remains essentially unknown. Change is effectively a gamble that the new state of being will be better than our current one and, even with very low stakes, that can add a frisson of fear. Success in the realm of writing brings its own concerns. While dreaming of people reading your work, you may simultaneously dread the exact same thing. Not just because you fear your work may be judged harshly or misunderstood, but because it may be understood too well. What if people read your book and infer things about your character you would prefer remained hidden? Success in writing equals exposure. And, let’s face it, that is scary. Success in publishing also brings new pressures. Deadlines, the expectations of agents, editors and readers, the pressure to ‘build a platform’ and promote your work. If you envisage these things too thoroughly – and feel alarmed by them – they may rise up to block you from sending your manuscript out (or even finishing it in the first place). Finally, and this one is a biggie: You might feel you do not ‘deserve’ success. I’m not suggesting that this one is easily solved, but sometimes recognising (and examining) a negative thought can lessen its power. Also, if you feel that you don’t deserve success, that you are unworthy of prioritising your writing or getting published, please know you are not alone. There is even a snappy name for it: Imposter Syndrome. This is the feeling that your achievements (getting a book contract, a great part in a play, starting a successful business) have been acquired via an administrative error and, any moment now, the real experts/professionals/Judges of Artistic Merit are going to turn up and take it all away from you. It’s a feeling which doesn’t go away with external validation – in fact it can get worse the more successful you become. So, the best thing to do is to keep reminding yourself that all of your most-beloved authors, musicians, actors and artists have almost-certainly suffered from it at some point (and probably still do). Plus, if nobody feels like the ‘real deal’ you can stop waiting for that magical day and get back to work. 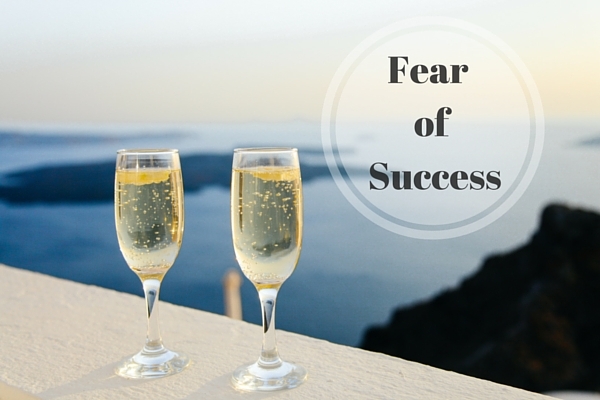 Are you letting ‘fear of success’ hold you back? Let me know if you want more on this topic in a future podcast! Thank you. That is most helpful and has made me think. Hard. Hi Sarah. Thanks so much for reading and commenting. I’m glad you found it helpful. Good luck!